Viessmann vs Vaillant are two of the best German boilers you can buy in the UK today. While Vaillant is the better known brand in the UK out of the two, Viessmann have brought their commercial heating experience to their domestic boiler range and have won the Best Buy Boiler award for the 2nd year running. You can find online reviews on everything from a pin to a plane online in 2019. You can do your own thorough, detailed research on any product before buying it. 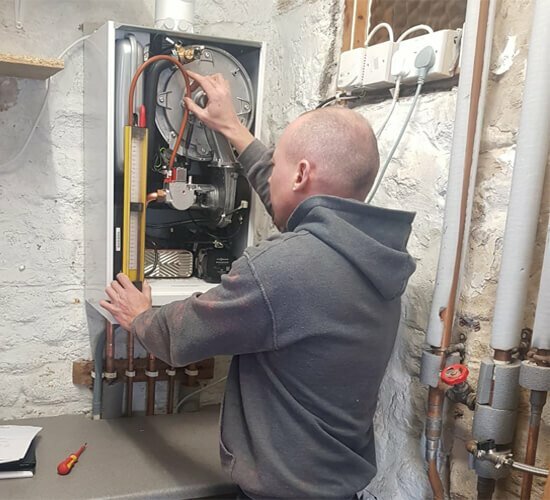 If you suffered a boiler breakdown during 2018’s Beast from the East and it’s still too fresh in your memory, and you don’t want to repeat that during another harsh winter, chances are you may be looking at a boiler replacement right now. Let’s take a brief look at both Viessmann and Vaillant. 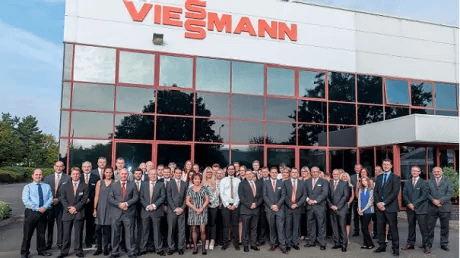 Viessmann are one of the leading international manufacturers of heating systems, and have rapidly become the boiler of choice around the world, for reasons you’ll see later in the post. Viessmann, founded in 1917, now has over 12,000 employees across the world. They are truly international with presence in 12 countries with 23 production divisions, subsidiaries and representations in 74 countries, and 120 sales offices around the world. What a lot of people don’t know is that Viessmann are world leaders in the commercial heating space. They are also number 1 in Europe for the same category. Several large buildings around the world run on Viessmann’s commercial boilers. These include stadiums like the Principality Stadium in Cardiff, corporate headquarters, and large factories (including Vaillant’s factory in Germany, because they couldn’t make a boiler big enough). That commercial heating experience segues very nicely into the domestic sector, resulting in powerful, high efficiency boilers, all of them winning the coveted Best Buy UK award from a prominent consumer research magazine. While Viessmann’s foray into the UK domestic boiler market has been comparatively recent in 1989, compared to rival boiler manufacturers, they have caught up at blazing speed. Any complaints about non-availability of spare parts are now ancient and irrelevant, as Viessmann have made sure to address those. Their UK headquarters are at Telford, and all the spare parts are stocked at Plumbases around the UK and other plumbing merchants. Plus an extensive network of engineers means a Viessmann engineer can be at your doorstep within 24-48 hours to resolve any boiler issues, which rarely happens because these boilers are so reliable. Viessmann’s current product range includes gas, oil, steam and biomass boilers, hot water cylinders, combined heat and power generation, photovoltaics, air and ground source heat pumps, refrigeration cabinets, coldrooms and biogas plants. 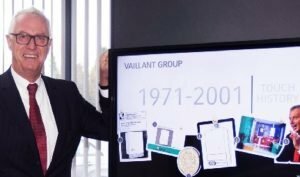 Along with Worcester Bosch, Vaillant have been market leaders in the UK for a long time, and have created front-running products in the industry. From water heaters in the 1900s, to the combi boiler about 30 years ago. In the renewable technology space, Vaillant are developing systems which utilise sustainable energy sources. Vaillant products consistently get high energy efficiency ratings and low emissions, and have a great reputation for performance, quality and reliability. They also own the Glow-Worm boiler brand in the UK. Vaillant are present in over 20 countries with exports to more than 60 states. They are an international family-owned company. They are the second-largest European manufacturer in the heating technologies sector. In addition, Vaillant are also active in the ventilation and air-conditioning technology markets. The company develops and manufactures its products and services at sites in the UK, Germany, France, Spain, Italy, Slovakia, Turkey and China. Much like Viessmann, they have ventured into the storage combi boiler space as well with their ecoTEC Plus Combination Store model, which is a combi boiler with a water tank. 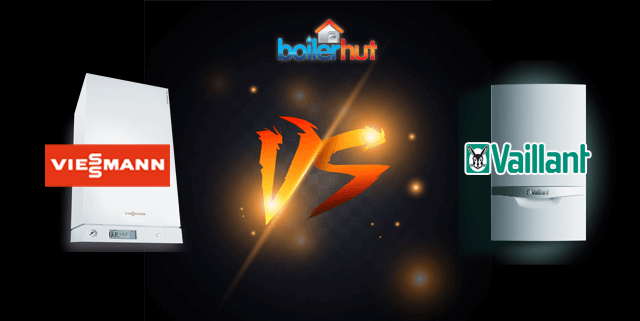 Before we start, let us point out that both, Viessmann vs Vaillant, make excellent boilers. You will get many years’ worth of efficient home heating and consistent hot water with either Viessmann vs Vaillant. Or Worcester Bosch for that matter. Having said that, a new boiler purchase is one of the most important buying decisions a homeowner can make. And so, you want to be extra careful in choosing the best boiler. Because you don’t change boilers every year, whichever boiler you choose will have to last you at least between 10-20 years. 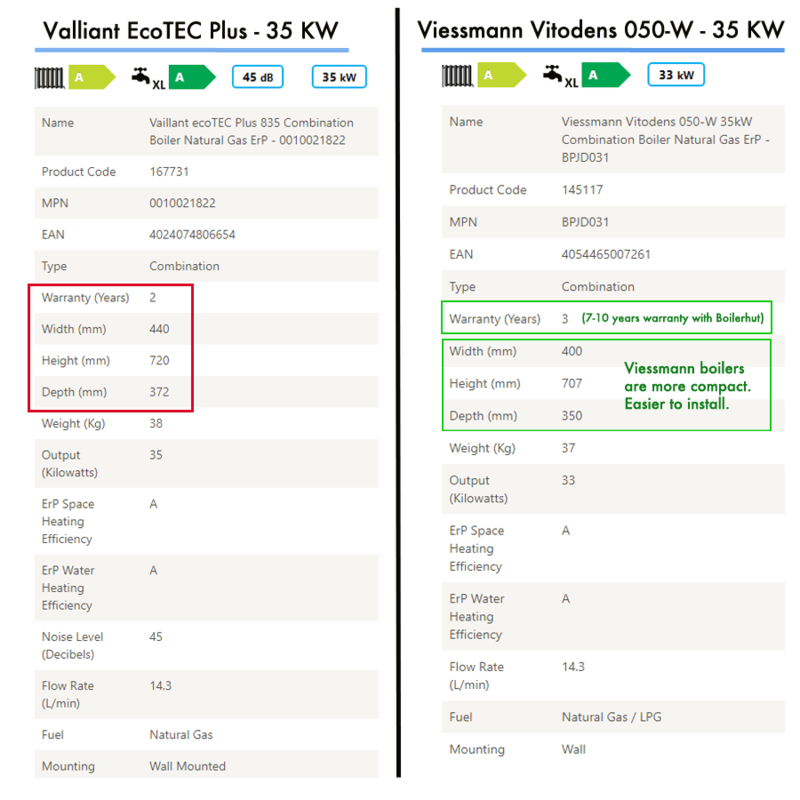 Below is a comparison chart for competing 35 KW boilers from both Viessmann and Vaillant. Specs are almost the same, except for some minor differences and one major difference when it comes to warranty. We hope the following review will help you make a more educated buying decision and make it easier for you to choose between Viessmann vs Vaillant boilers. Viessmann make some of the highest energy efficiency heating systems in the world. Their Vitodens 200-W boiler delivers a whopping 98% energy efficiency with superior MatriX Burner and Future Proof Lambda Controller in combination with a Weather Compensation sensor. Their 100-W range is also high on energy efficiency at 94%. The 050-W is their entry level combi-only model. Conclusion: Viessmann is more efficient for competing models, but only slightly. 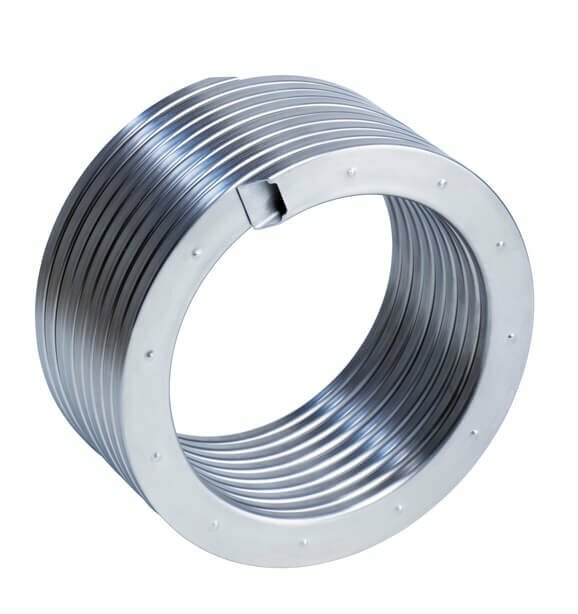 Viessmann are comfortable offering 10 year warranties on their stainless steel heat exchanger, because they are confident in its reliability and durability. Vaillant offer only a 2 year standard warranty on their boilers with an aluminum heat exchanger. To get extended 10 year warranties (only available on their high end models), you’ll need a Vaillant Advance Installer, and for the boiler to be installed with a Vaillant Boiler Protection Kit and registered on Advance. Conclusion: Viessmann edges it when it comes to warranty. The internal working components of a boiler have to operate in extreme environments inside a boiler, tolerating ridiculous thermal and mechanical stress, various types of system water qualities and dissolved oxygen. They also have to tolerate effects of corrosive condensate. Which is why it’s crucial that the boiler manufacturer uses materials that are specifically designed to withstand inhospitable environments. One such component is the heat exchanger. Boiler manufacturers use two types of heat exchangers: Aluminium and Stainless Steel. Stainless steel is vastly superior to aluminium when it comes to withstanding extreme temperatures, and resistance to corrosion. Majority of the boiler manufacturers in the UK use an aluminium heat exchanger, except a handful who use a stainless steel heat exchanger. Viessmann is one of those handful. Viessmann have pioneered the Inox radial stainless steel heat exchanger, which is exclusive to their Vitodens range, and pretty much the best, highest quality heat exchanger in the market right now. This helps Viessmann achieve the highest efficiency of 90% among its competitors, going as high as even 98% efficiency on some higher end models like the 200-W. Stainless steel heat exchangers have become the preferred option to deliver long term efficiency and reliability. And for condensing boilers, a stainless steel heat exchanger can last up to 5-7 years longer than one with an aluminum heat exchanger. The grade of stainless steel used in a heat exchanger must also be highly resistant to corrosion, internally, and externally, so that the component retains its efficiency throughout the boiler’s operating life. 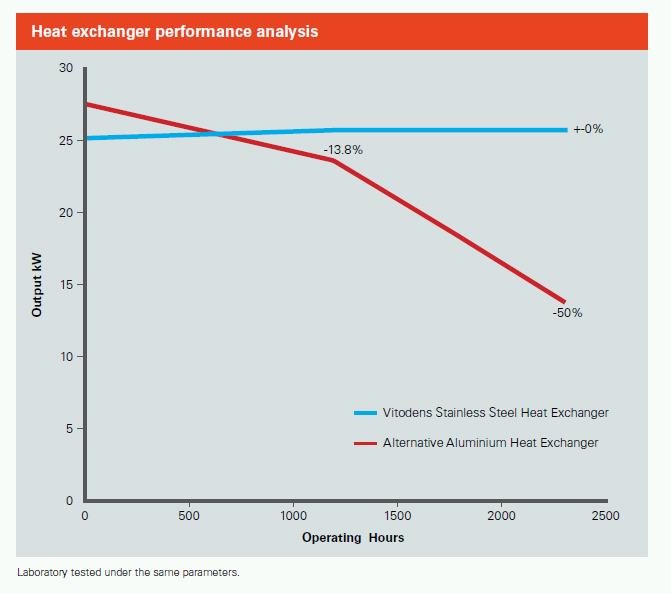 Below is a comparison of the lifespan of a stainless steel heat exchanger (in blue) vs an aluminium heat exchanger (in red). If you haven’t come across what’s called a “water hammer”, you’re lucky. If you don’t know what that is, it’s loud rattling of your water pipes every time you open a tap in your house. Water hammer is a pressure surge or wave caused when a fluid (usually a liquid but sometimes also a gas) in motion is forced to stop or change direction suddenly (momentum change). A water hammer commonly occurs when a valve closes suddenly at an end of a pipeline system, and a pressure wave propagates in the pipe. It is also called hydraulic shock. This pressure wave can cause major problems, from noise and vibration to pipe collapse. It is possible to reduce the effects of the water hammer pulses with accumulators, expansion tanks, surge tanks, blowoff valves, and other features. Viessmann’s built shock arresters right into their boilers, reducing, limiting, or even avoiding the water hammer problem all together. Anybody who’s experienced a water hammer problem knows what a nuisance it is. Basically it’s like someone hammering your walls every time someone opens a tap in your house. Even more enjoyable when someone in your house is taking a shower at 6 am on your weekend off. Conclusion: Viessmann is the clear winner here. For the exact same output of 30 KW, the Viessmann boiler is a whopping £238.80 cheaper! Your obvious next question will be “Why is the supposed better boiler cheaper?” I mean isn’t stainless steel more expensive to source than aluminium? As we mentioned above, because of Viessmann’s experience in the commercial heating space, and the fact that they manufacture most of their patented components in-house, they can compete at the same price point as their rivals. Also, the fact that Viessmann’s rival boiler brands source internal components from a third party provider factors into the overall cost. What’s even more surprising in all this is the fact that Viessmann is technically a superior boiler! Conclusion – Viessmann is more affordable. It’s easier to install Viessman boilers because of two main factors. 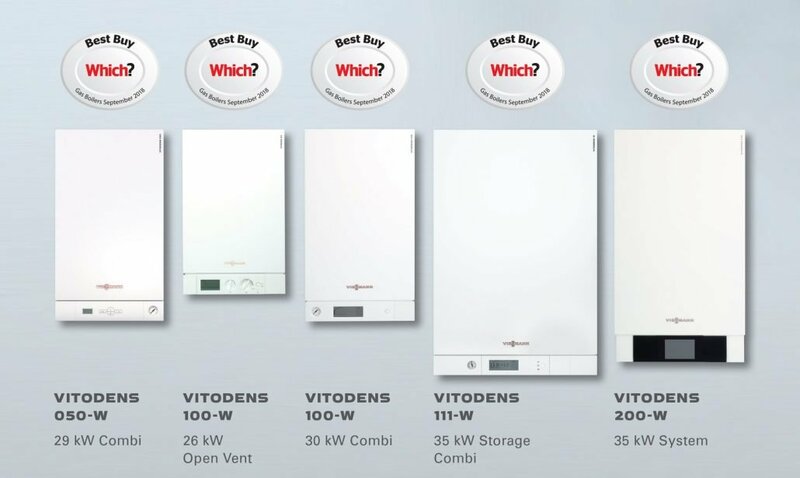 Viessmann boilers are more compact, as you can see in the comparison chart above. Even if the difference is small, sometimes it can make all the difference. The condensate and pressure relief pipe is combined inside a Viessmann boiler, which makes it easier to cite the boiler. Viessmann is cheaper by £400-£500 for the same capacity boilers. Viessmann is slightly more efficient. Up to 98% efficient on select models. Viessmann offer 7-10 years warranty, almost 2-3 times that of competitors. Viessmann boilers are technologically superior and use Inox-radial stainless steel heat exchangers. Which also makes them more reliable. Because Viessmann are more compact, and because the condensate and pressure relief pipe is combined, it is easier to cite and install them. Viessmann’s headquarters are now in Telford, Shropshire, so parts are readily available. Plus Plumbase carry all Viessmann parts now, so availability around the UK is absolutely not an issue anymore. Annual servicing cost is about £80 to preserve manufacturer’s warranty. I will never, ever buy Vaillant product again. After two years a heat exchanger has crack and my kitchen was flooded. The service is unacceptable, it’s been over a week now and I’m still without hot water and heating and it’s been around 2 to 7 degrees outside. If you would like to have similar experience, then Vaillant products are for you. Once you’ve gotten an estimate, one of our team members will contact you and finalize the quote with you over the phone. We can install within 2-3 days. You can also call us on 029 2009 9898 or email us on sales@boilerhut.co.uk. What about a Worcester Bosch that come at the top of the Which list? I’ve had a Worcester for many years and found this to be a great boiler. Thanks for your comment. Worcester Bosch are great boilers and are market leaders for a reason.